This number does not suggest an overheating economy. During a 60 Minutes interview last week, Federal Reserve Chairman Jerome Powell said the central bank did "not feel any hurry" to make a rate move. Wednesday: The Federal Reserve wraps up its two-day policy meeting. Friday: February existing home sales. 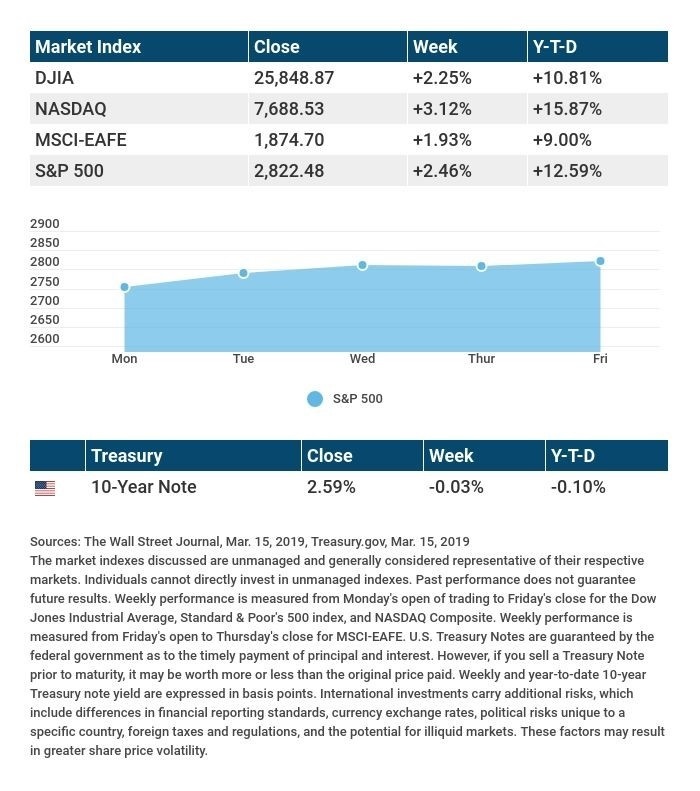 Source: Econoday / MarketWatch Calendar, March 15, 2019 The content is developed from sources believed to be providing accurate information. The forecasts or forward-looking statements are based on assumptions and may not materialize. The forecasts also are subject to revision. The release of data may be delayed without notice for a variety of reasons, including the shutdown of the government agency or change at the private institution that handles the material. Source: Morningstar.com, March 15, 2019 Companies mentioned are for informational purposes only. It should not be considered a solicitation for the purchase or sale of the securities. Any investment should be consistent with your objectives, time frame and risk tolerance. The return and principal value of investments will fluctuate as market conditions change. When sold, investments may be worth more or less than their original cost. Companies may reschedule when they report earnings without notice. Any companies mentioned are for illustrative purposes only. It should not be considered a solicitation for the purchase or sale of the securities. Any investment should be consistent with your objectives, time frame and risk tolerance. Withdrawals from traditional IRAs, SEP-IRAs, and SIMPLE IRAs are taxed as ordinary income and, if taken before age 59 1/2, may be subject to a 10% federal income tax penalty. Generally, once you reach age 70 1/2, you must begin taking required minimum distributions from these plans.